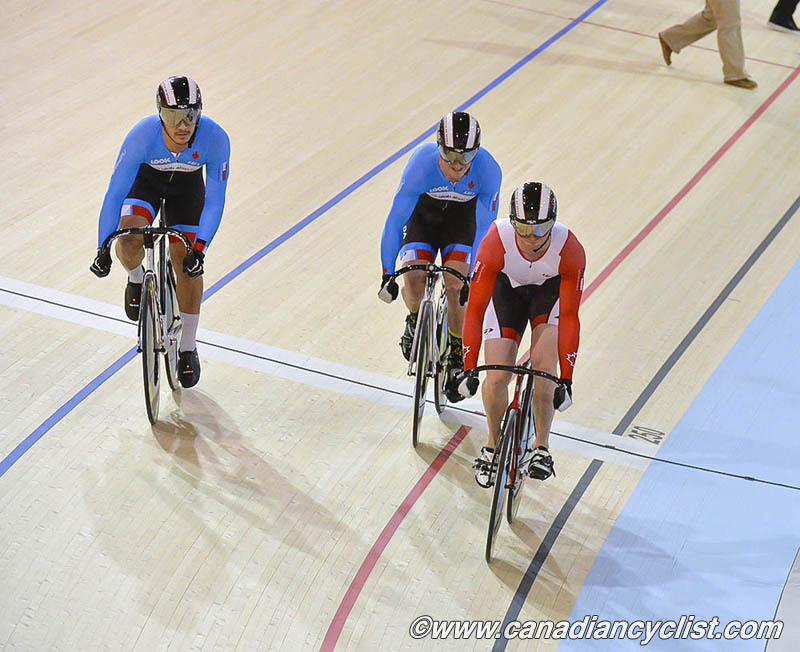 After a 'soft' opening last weekend with the Canadian National Track Championships, the new Canadian indoor velodrome in Milton, Ontario, had its official unveiling on Friday night with the UCI sanctioned Milton International Challenge. Nine countries are represented for both team and individual events - Canada, USA, Jamaica, Trinidad, Germany, Austria, Netherlands, Norway, and the United Kingdom. 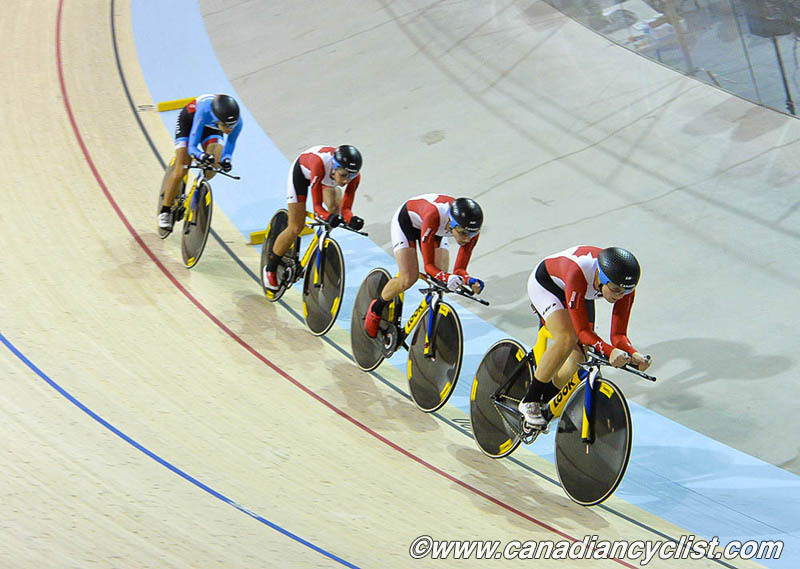 The velodrome is the only covered 250 metre track in Canada, and one of two in North America. The other, the Velo Sports Center, in Carson, California, is not actually a UCI Category 1 homologated venue (it does not meet certain requirements, such as entry to the infield from within the building), making Milton the only facility in North America to meet UCI standards for events such as World Cup and world championship competition. The Milton track is a $56 million public and private partnership that was built to host the Pan Am / Parapan Am Games this summer, and will become the home of the Canadian national team, which will move into their offices over the next few weeks (as will the Ontario provincial association). It is 7 metres wide with 42-degree banked turns and 13-degree banked straights. It is built with Siberian spruce. Already, the track is garnering praise from many sources, with one international mechanic saying "it's like they went and looked at all the mistakes other tracks have made, and fixed them." Monique Sullivan, Canada's top sprinter, who finished sixth in the Keirin at the London Games, and won four national titles here a week ago said, "it's so awesome to be here, I can't believe we are actually in Canada. It's a little bit wider and a little bit flatter [than many tracks], which I actually prefer. It's not super steep to get to the top [in the corners]. I like that style, and it's easier to learn on this track, so it will be nicer for new riders." 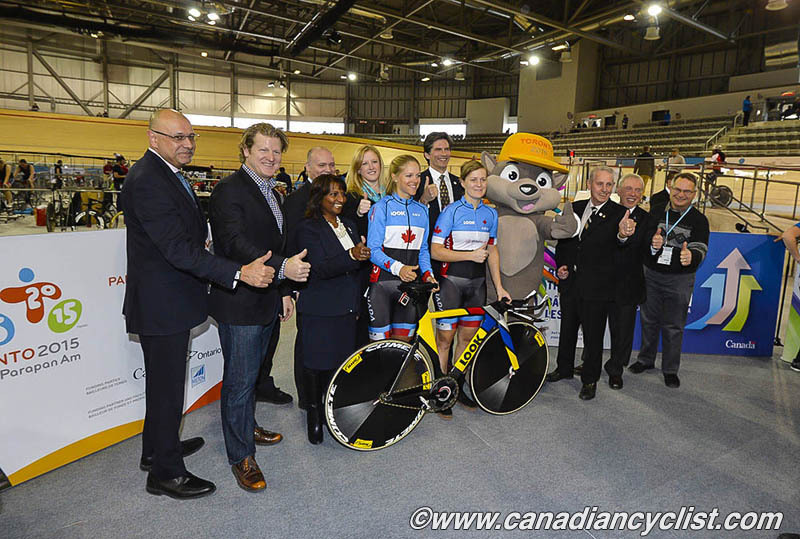 After an official opening, with local federal and provincial members of legislatures, the local mayor, Pan Am officials and Cycling Canada officials, racing began Friday afternoon with the team events, the start of the Sprint competition and the Scratch races. 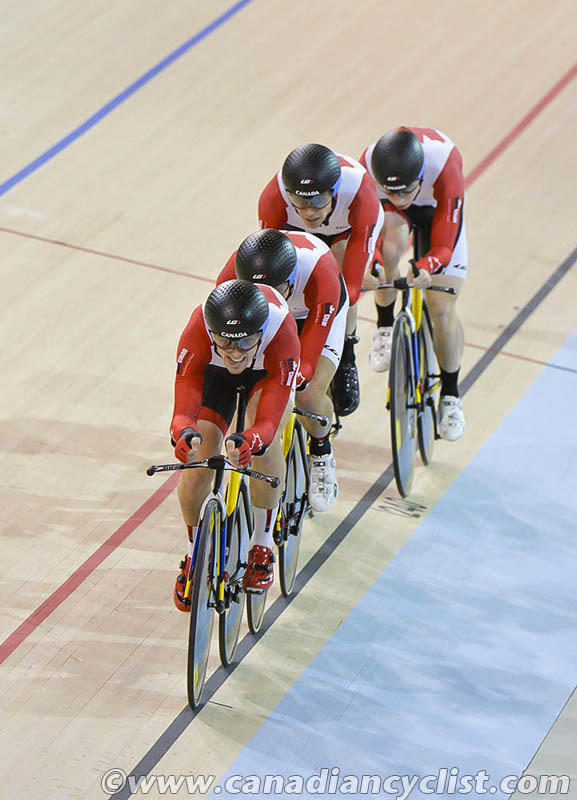 In the Team Pursuit, both the men's and women's Team Canada squads, the primary World Cup squads, easily won the gold medals by catching their opponents. The women's squad faced Team Canada Development (B) by overtaking their opponents just past the 2500m mark of the 4000m race. The winning team featured World Cup medallists Jasmin Glaesser, Stephanie Roorda, Laura Brown and Kirsty Lay, with Allison Beveridge replacing a sick Brown for the final. In the men's race, Team Canada caught a composite team, Fun Boyz, to win gold after two restarts. The catch took less than half the race. "Judging by our coach, Ian Melvin, we were right on pace. The fact that we caught them just 1600m in is pretty impressive. We were expecting to go through to the 3-3.5 km mark just like we did at Canadian Championships [last week]," said Eric Johnstone. "From where we were a year ago to where we stand today, it's absolutely amazing. The progression we've made in the last 12 months is tremendous, and it's so cool to be part of this program. We're hoping for a really good ride in Cali, and crack the Top 8. We've looked at the numbers after London, and we were so close from the Top 10, knocking on the door. We are going to have to fight hard next year all the way, with the World Cup season and the Pan-Am Games, if we want to get to the Olympics." Monique Sullivan and Kate O'Brien proudly showcased their new Canadian Champion jersey in the women's Team Sprint final, winning a tight race against Team Netherlands by just 0.05 seconds. "It's always fun to compete, and always really fun to win," said Kate O'Brien, who also competes in bobsleigh throughout the winter months. "It's been so fun to do both cycling and bobsleigh at the same time. Both federations have worked really well together. It sounds cliché, but I am totally living the dream right now." For Sullivan, who lost her voice in the last couple of weeks, she couldn't be happier. "It's awesome to be here. I can't believe we are doing our final preparation for the next World Cup right here at home, on this track. I am still in shock that this velodrome is ours." 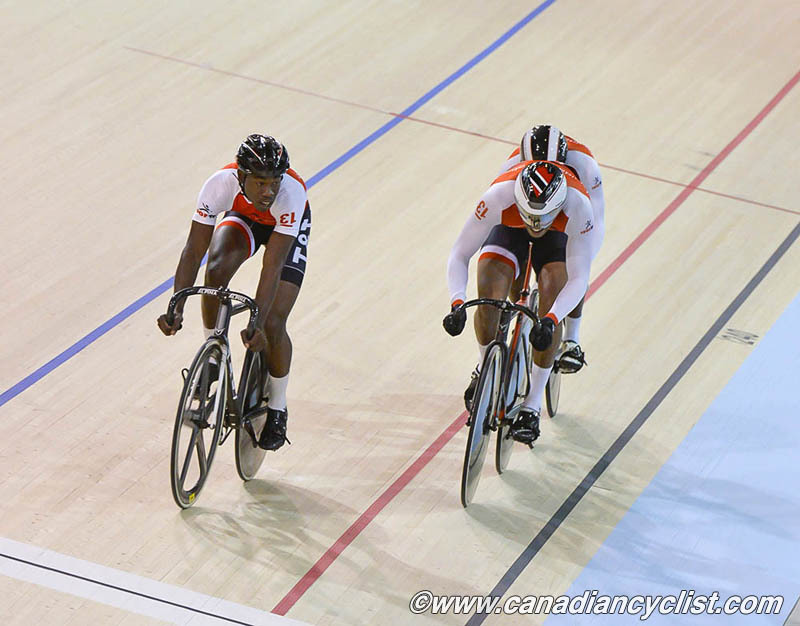 The Canadian men's Team Sprinters faced the powerful Trinidad squad in the finals, and took the silver medal. Trinidad had on its squad Njisane Phillip, who finished fourth in the individual sprint at the last Olympic Games. Trinidad won the event with a final time of 46.356 seconds in the gold medal showdown, beating the Canadians by more than one second. 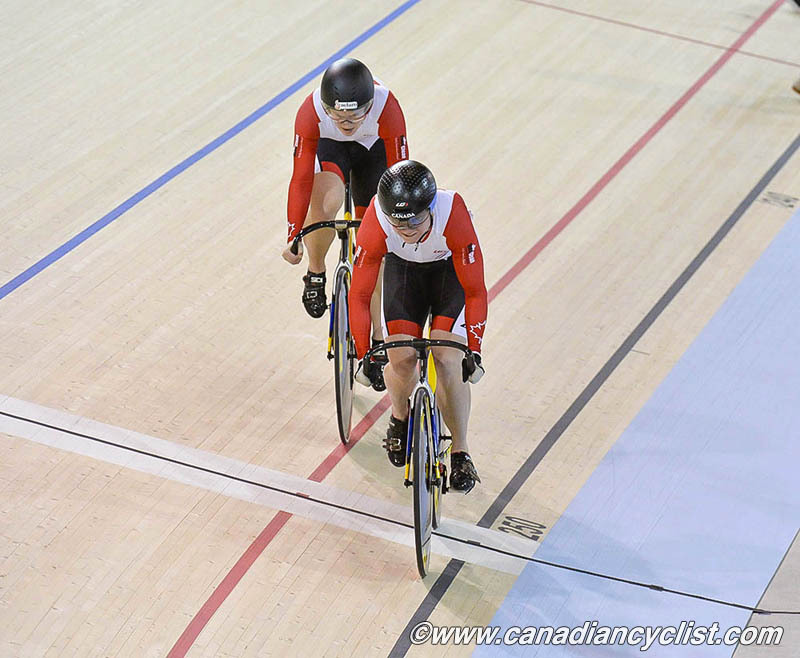 it should be noted that neither Hugo Barrette nor Joseph Veloce, Canada's top sprinters participated on the Canadian squad of development riders, saving their efforts for the Sprint event. In the women's Scratch race, Norway's Anita Stenberg won the gold medal thanks a powerful effort in the last lap, beating Americans Judith Bloem and Colleen Hayduk at the finish line. The men's Scratch race saw Nicholas Rogers of the United States take the victory after a solo effort in the last five laps. Rogers was part of a three-man attack that successfully lapped the field. Zachary Kovalcik of the USA and Dylan Davis of Canada were the other members of the lead trio, finishing second and third, respectively. In Sprint qualifying, Sullivan and Veloce took the top spots. Racing continues Saturday and ends on Sunday.